Why the underlying fiber network is critical to mobile communications. -- The explosion in popularity of the mobile game Pokémon Go has triggered unprecedented attention on virtual reality (VR) and augmented reality (AR). Many believe that Pokémon Go is just the first step into the fully-immersive VR and AR applications, which, from a bandwidth demand perspective, are on the high end of the Internet of Things (IoT) connections. By the end of this decade, analysts predict that 50 billion IoT sensors will connect to mobile networks consuming 1000 times as much data as today’s mobile gadgets alone. Along with cloud, machine to machine, and new video streaming applications, the underlying network infrastructure that enables such constant high-quality connectivity is critical to ultimate user experiences. None of the existing radio access technologies will be able to individually provide the capabilities to effectively meet market demands. The next generation 5G mobile system is being designed specifically to support this vision of satisfying the increasing demand for higher data rates, lower network latencies, better energy efficiency, and reliable ubiquitous connectivity. However, the success of 5G will not just be about new wireless technologies! The deployment of 5G technologies will be dependent on the ability of the wireline transport network connected to the radio access networks (RANs). This is because all the air bits will be transported from the wireline systems, most likely high-speed fiber optic networks. The network architecture and topology are evolving too (see Figure) and we expect to see a proliferation of small cells deeper in the network closer to the end-user. Small cells have a range of 10 to 200-meter cell radius within urban and in-building locations, to 1 or 2 km in rural areas. Centralized or Coordinated-RAN solutions, where the baseband units are placed together and share information at a centralized location, require the extremely high speed and low latency only available using fiber networks. The reality is… in mobile networks the bits are only air bits for a very short part of their life! Historically, the transition to new mobile technologies has resulted in the need for a fourfold to fivefold increase in backhaul capacity. With the advancement from 3G to 4G, RANs reached a capacity of 1 Gb/s to 10 Gb/s per cell. 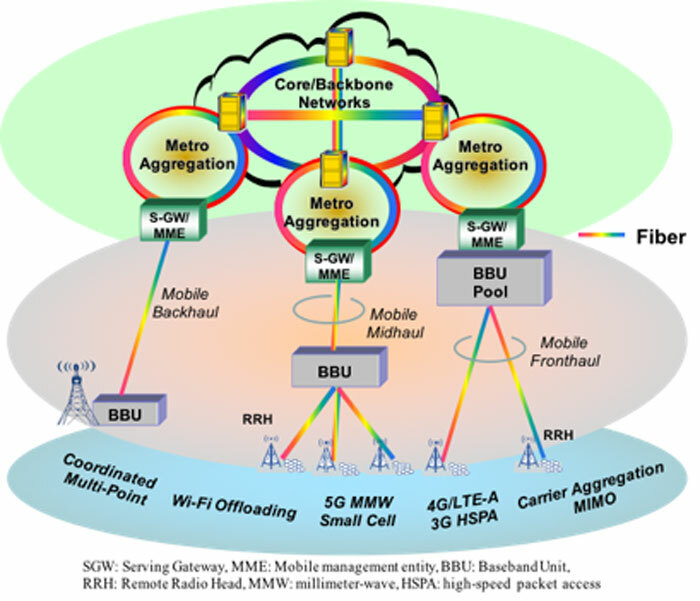 If you consider the effective throughput for each user and the deployment of multi-antenna technologies, future 5G RANs will require ten times the backhaul capacity of today’s networks. If 5G network technology is deployed at scale, wireless networks will have to xhaul (backhaul, midhaul, and fronthaul) massive amounts of data between cell sites and core networks. Compared to alternatives like mm-wave self-backhauling, deploying optical fiber provides a superior technical solution due to bandwidth scaling, low and deterministic latency and jitter, and high system reliability. Optical techniques can also provide the leverage to enhance inter-cell coordination, achieve wide network coherence, and also decrease timing jitter in high order vector modulation and simplify remote radio head architecture. In this sense, fiber is not only the transmission pipe, it can integrate with wireless systems for end-to-end seamless networking purpose to affect network control and power efficiency, minimize latency, provide network system protection and restoration, and decrease digital data processing overhead. Fiber and optical transport technologies are expected to play more and more important roles in the RANs to meet the aggressive performance goals of 5G. CableLabs is heavily involved in both the wireless and wireline portions of RANs. On the wireless portion, CableLabs is contributing to the ongoing formation of 5G technologies and network architectures including multi-gigabit wireless transmission over millimeter-waves and dense mobile and fixed wireless access. On the wireline portion, CableLabs is exploring new fiber optic technologies that increase capacity and lower latency, while also leveraging the unique characteristics of Hybrid Fiber Coax networks. Leveraging our expanded efforts toward university research, we are exploring the melding of wireless and wireline through collaboration with the National Science Foundation’s Fiber-Wireless Integration and Networking (FiWIN) center led by Georgia Tech.